Did You Know…what the impact is of parents who take an overprotective or excessive interest in the lives of their children? 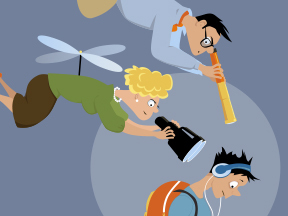 Parents who take an overprotective or excessive interest in the lives of their children are called “helicopter parents.” I believe the only good that comes from being such a parent is that maybe your kids are slightly less likely to be abducted. Some say other advantages of being a helicopter parent include having kids who are always prepared, forms are always filled out, bags packed correctly, supplies purchased in advance, and books returned on time. And, yes, those are advantages—but not worth the downside (need for constant feedback, high sense of entitlement, undeveloped life skills, etc.) that comes with it. What gets lost in all of this overbearing parenting is the most valuable gift a parent can give a child: self-reliance. Lessons taught during the formative years of childhood are so significant to who the child becomes later. So, parents, take a step back to make sure you’re not doing the work that could be addressed by your children. I realize that when push comes to shove it’s easier to handle these tasks without involving your kids. Take the tougher road and teach kids how to handle daily tasks themselves. My guarantee is the payoff will be worth it in the long run.